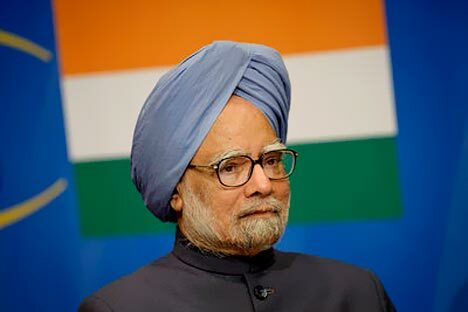 Indian Prime Minister Manmohan Singh resists pressure from the EU to curtail trade with Iran over its suspected nuclear weapons programme, stressing that diplomacy was the best way to deal with the concerns. In the wake of new oil sanctions by the European Union (EU) and US on Iran, India has recently come under a heavy pressure from the Western powers to curtail its trade with Tehran and use its influence to get Iran to resume talks over its nuclear programme. India is a major importer of Iranian oil and it announced on the eve of its talks with the EU on February 10 in New Delhi that it would dispatch a large business delegation to Tehran later this month to exploit the trade opportunities in the aftermath of the latest round of sanctions slapped on Iran by the European Union and the United States to block its oil revenues and force Iranian leadership to come to the negotiating table over its suspected nuclear weapons programme. The European Union clamped an embargo on Iranian oil supplies on January 23 as one of the toughest measures yet to force Tehran to terminate its controversial nuclear plans and return to the negotiation table. The move stipulates an immediate ban on all new oil contracts with Iran, while existing contracts will be honoured until July 1. Oil exports make up about 60 percent of Iran’s revenues. Of about 2.2 million barrels of daily Iranian oil exports, 18 percent is bound for European markets. Earlier this month, following the EU oil ban, the US Senate Banking Committee approved a sweeping package of tough new sanctions intended to coerce Iran to drop its controversial nuclear programme. The new sanctions, which have yet to be approved by the US Congress, target foreign banks handling transactions for Iran's national oil and tanker companies, as well as foreign subsidiaries of US companies doing business with Iran. They also include measures that directly target individuals and companies linked to the Iranian Revolutionary Guards (IRG). Washington and the EU claim that Iran, on which UN Security Council has already imposed four sets of sanctions, has been pursuing a secret nuclear weapons programme. Tehran has repeatedly denied the accusation, insisting its nuclear programme was solely for civilian peaceful means. Tensions have mounted to a boiling point since Iran announced in early January that it had launched a nuclear enrichment programme at a facility near the holy city of Qom. The programme envisages enriching uranium to the 20-percent level, which can easily be turned into fissile warhead material. It is not difficult to see why Western countries are trying to present New Delhi’s defiance as possible “spoiler of their game-plan” and even openly attempt to interfere in its foreign policy to push it to use its good offices to press Tehran to bring it to the negotiating table. This, in particular, when the threats against Iran’s nuclear facilities are looming large with the US and Israel talking about the timing of the air strikes. The Iranian issue was discussed prominently at the 12th India-European Union Summit in New Delhi last Friday, with European Council President Herman Van Rompuy expressing his “deep concern” about Iran's nuclear ambitions. “We will share, I think, our deep concern on the Iranian nuclear programme, and will ask Prime Minister Manmohan Singh to use India’s leverage towards Iran to help bring Tehran back to the negotiating table,” Rompuy said at a joint press conference after the talks, defending the latest round of sanctions announced by the EU and the US. But in a striking note of difference with Rompuy, Singh resisted pressure from the EU to curtail India’s trade with Iran over its suspected nuclear weapons programme, stressing that diplomacy was the best way to deal with the concerns. The EU and US want India to reduce its dependence on Iranian oil as they claim that Tehran is using oil revenues to develop nuclear weapons. But despite imposition of economic sanctions by them, India continues to import oil from Iran. India imports $12 billion worth oil annually from Iran. It is the second largest importer of crude oil from Iran and its daily imports from Iran vary between 350,000- 400,000 barrels. The Western powers have from time to time used institutions and countries from the Asian Clearing Union to Turkey to block its payment route. Before the India-EU summit, Indian Commerce Secretary Rahul Khullar said there was no reason why India should not take advantage of business opportunities arising as European companies reduce sales to Iran. Sanctions on Iran had long made oil import difficult because Indian oil importers had to scramble to find banks willing to handle transactions with Tehran. But under a new agreement, India and Iran have settled the issue of oil supplies with New Delhi to make 45 percent of overall payment in Indian rupees and pay the rest by investing in Iranian infrastructure, Iran’s ambassador to India, Seyed Mehdi Nabizadeh said last week. India is prepared to supply Tehran with a large consignment of foodstuffs despite the West’s sanctions, Khullar said. He said India will expand the list of exports to Iran to pay for part of oil imports from Iran. “We are certainly not losing profit, and it’s clearly up to the US and the EU to stop or not to stop exports to Iran. But Delhi will continue trading with Tehran,” he added. Iran has already vowed a “painful” response to any attack by Israel on its nuclear facilities and has also threatened to block the Strait of Hormuz, a strategic and vital Gulf shipping route, in retaliation to new EU ban on Iranian oil through which an estimated 40 percent of the world's seaborne oil passes. The International Monetary Fund (IMF) has warned that sanctions on Iran could push oil prices up 20-30 percent to $140 per barrel unless alternative supplies from developing countries came on line. Last Thursday, the European parliament called on Russia and China to back UN Security Council sanctions against Iran and cease assisting its nuclear activities. Traditionally, Moscow has been against excessively pressuring or, worse yet, using military force against Iran. It has also denied that there is a military component in Iran’s nuclear programme. Like India which has advocated a diplomatic dialogue to resolve the Iranian nuclear problem, Russia also has always held the view that unilateral sanctions “do not help” when trying to overcome the Iranian nuclear deadlock. Moscow expressed regret and alarm immediately after the EU’s ban on Iranian oil, stressing its opposition to Western sanctions against Iran, saying they reduced the chances of ending the confrontation over its nuclear programme. “It is obvious that what is happening here is open pressure and diktat, an attempt to ‘punish’ Iran for its intractable behaviour,” Russian Foreign Minister said in a statement after the EU countries agreed the measure on January 23. He reiterated Russia’s call to use non-military means for solving the Iranian nuclear issue. “We are concerned about Iran’s nuclear issue. This issue should be solved peacefully, any military means should be excluded,” Lavrov said on Monday in Moscow after a meeting with his UAE counterpart Sheikh Abdullah Bin Zayed Al-Nahyan. The talks between the IAEA and Iraous visit of IAEA observers to Iran were held on the invitation of the Iranian side on January 29-31. Russia has proposed a plan under which existing sanctions would be eased in return for steps by Tehran to instill trust and wants the proposal to be discussed if the talks, stalled for a year, resume. Iran last held six-party talks in January 2011 and negotiations broke down without any commitments to hold future discussions. Following the new oil sanctions, Iran stated it was in touch with the six global powers, including Russia, China, US, Britain, France and Germany, to reopen talks soon. But the EU denied it saying Iran must show it is serious about demonstrating that its nuclear programme was purely peaceful. Ahmadinejad also said Iran would not bow to pressure and budge from its principles, stressing the West should cease speaking to Iran “in the language of force” if it wants to resolve the dispute over Tehran’s nuclear programme. Russia has repeatedly warned that a military strike on Iran’s nuclear facilities would be disastrous for the region as a whole, saying Western powers should adopt a policy of non-intervention in the Middle East and North Africa. On Tuesday, the Chief of the General Staff of the Russian Armed Forces Nikolai Makarov warned that the situation surrounding Iranian nuclear programme was likely to come to a head by the summer. He said Russian Defence Ministry is monitoring the situation in Iran and the entire Middle East from a recently created situation centre. “We used to have a general on duty at each main command. Now we have created a situation centre that receives all the necessary information in real time,” Makarov said.